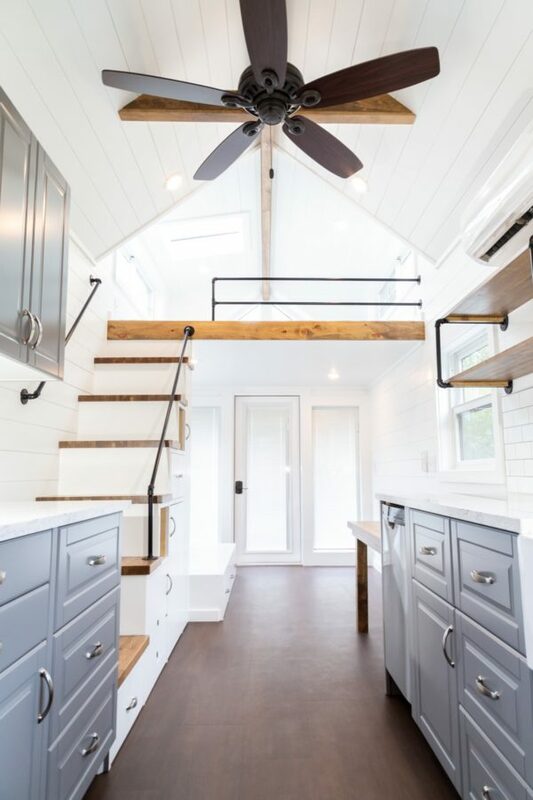 28-Foot Tiny House with 408 Sq. Ft. Inside! This is the 28ft Farmhouse by Liberation Tiny Homes. It features 408 sq. ft. of interior space including the lofts. Excellent use of space. The bathroom is above-par for a TH. Love the white interior and gray cabinetry. Just wish the outside had more curb appeal, but overall, this is a winner! Thanks, Sparrow, glad you enjoyed it! However if you park on a permanent site you can always clad the outside. My neighbour 2 down lives in a THoW (all you can get permission for around here, permanent a non starter) which is connected to the mains water and electric with septic tank. He has clad it in a brick siding so it looks like a foundation place and has added conservatories off the living area at the front and over the side door instead of a porch for shelter. Space is nearly doubled and as you are allowed here to add in a certain percentage of the building without additional planning permission it is a fast and relatively inexpensive way to increase your living space. I know one person who started off with a tiny 2 bed house but by adding glass conservatories on 3 sides has nearly doubled the size while double glazing and heaters mean they can be used for most of the year even in Ireland. I like the layout of this unit it has a sizeable kitchen and nice bath. I would like to have an oven unit and not just the burners in the kitchen. The color combination allows for adding pops of color in any palette you choose I think I would have moved the stairs so that they were on the side close to the trailer to make the deck more usable — you could then build a little table unit to cover the hitch part that comes through the door and put a removable railing around the deck a chair on either side of the table and have a more functional deck space. I might have even brought the roof out over the deck then you could use the deck in inclimate weather. However, this is great in just 28 feet of space. Stunning! Love the space and the outside is unique looking. Could do a lot with this TH. Next post: The San Juan Curvy Roof Tiny House w/ Elevator Bed!